The True North Youth Foundation (TNYF) (formally the Winnipeg Jets True North Foundation) is pleased to announce the launch of its 50/50 Random Number Generator (RNG) at the Winnipeg Jets home opener on Thursday, Oct. 13 against the Carolina Hurricanes. 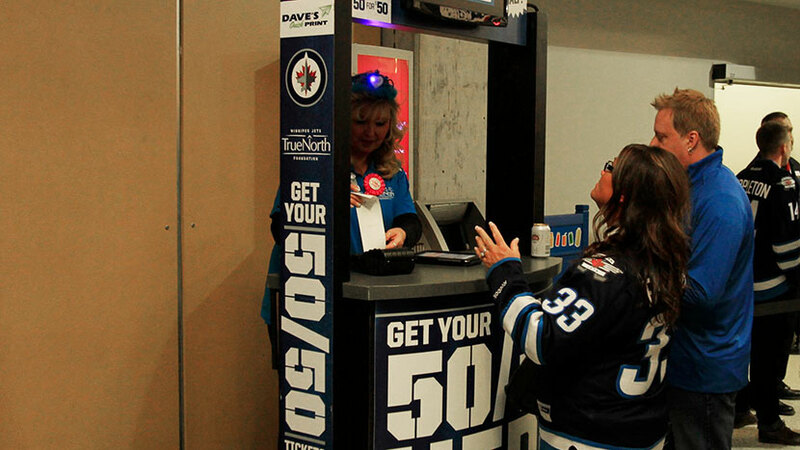 To complement the new digital enhancements in the MTS Centre, the 50/50 raffle at Winnipeg Jets and Manitoba Moose Games has moved from a paper and drum format to the RNG. The new system has been approved by the Manitoba Liquor and Gaming Authority. The RNG allows fans to receive the same experience of purchasing a 50/50 ticket, without noticing the new digital processing on the backend of the raffle. Purchasing an entry into the 50/50 draw will be similar to last season where 50/50 sellers process transactions via hand held tablets. Each individual number sold will be stored in a secured cloud server, instead of individually printing into the drum. The new version will ensure the increased integrity of the draw, as well as reduce its environmental impact. During the third period, fans will now be treated to an unveiling of the winning number on the scoreboard with the push of the button. The TNYF, with its 50/50 raffle provider, Bump 50:50 is proud to be one of the first programs in Canada to move to the RNG raffle platform. Our foundation would like to acknowledge the support of the Manitoba Liquor and Gaming Authority and Bump 50:50 for their collaboration to ensure our 50/50 program becomes more efficient, environmentally friendly, and secure. While in the concourses, fans will also notice the 50/50 booths are anchored by 65″ HD LED screens that prominently display the 50/50 sales, as well as videos that highlight the initiatives the 50/50 revenue supports. True North Youth Foundation would like to thank Winnipeg Jets and Manitoba Moose fans for supporting 50/50.